This review is part of the Green Books campaign. Today 100 bloggers are reviewing 100 great books printed in an environmentally friendly way. Our goal is to encourage publishers to get greener and readers to take the environment into consideration when purchasing books. This campaign is organized by Eco-Libris, a green company working to green up the book industry by promoting the adoption of green practices, balancing out books by planting trees, and supporting green books. A full list of participating blogs and links to their reviews is available on Eco-Libris website. 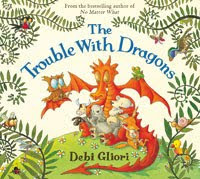 Smoke-spewing, thoughtless dragons can cause a world of trouble, and Debi Gliori, in her picture book The Trouble With Dragons, shows exactly how. The selfish (but otherwise nonthreatening) dragons over-populate their world, use up all the resources and find themselves in a pretty dire situation. The wildlife, forgotten in the shadows, worriedly watch as the Dragon's actions cause global warming and bring ruin to their natural habitat. Even Santa Claus' reindeer get caught up in the mess and leave Santa knee deep in the melted polar ice caps, his presents scattered in the water. What will it take for those Dragons to take notice and change their destructive ways? The pages of friendly, fire-breathing dragons cleverly show children in a non-frightening way that irresponsible actions harm the environment while providing suggestions on how to live sustainably. Older children will realize that the "dragons" in the story are not fantasy but slyly represent humans and our own treatment of the Earth. The rhyming text playfully relates an important message in terms children can understand. Gliori's visually interesting and detailed illustrations should spark some animated discussions, especially with older children. The large power plants, litter, destruction of forests - it's all here in this book. Gliori's brilliant decision to dramatically illustrate the wildlife as black shadows shows that the dragons aren't paying enough attention to wildlife. Only after the dragons listen to the animals' advice do the wildlife finally regain their colors and the world becomes a brighter and better place. The Trouble With Dragons not only contains a green message but is also printed with the environment in mind, using vegetable inks on FSC certified paper. Environmental awareness is something that author Debi Gliori takes very seriously. In an interview published by Booksfromscotland.com she states, "If we can rally our children round the recycle, re-use and reduce ethos, then we might have a hope of turning a potentially lethal global threat into something we can live with and hopefully overcome. Maybe, just maybe, our children will force us to behave correctly with regard to our custodianship of the Earth." For our own children's sakes, we cannot continue to live without regard to the environment. Only through committed efforts can we hope to create a culture of environmental responsibility. Reading picture books is one easy way to introduce children to environmental issues at a young age and encourage a lifelong respect for the Earth and its wildlife. Any other suggestions of children’s picture books about environmentalism or children's books printed using green practices? I'd love to hear about them! Sounds like a great book and if the cover's any indication, it's got great illustrations. I love that children's books are teaching youngsters about the environment. We have The Last Unicorn by Jane Yolen which is along similar lines. My daughter loves it. I like the message of this book and that the author is very interested in green practices. Love the cover first of all. And it sounds like a great book and teaching tool. I'll keep this one in mind for my nephew. Thanks for the review! It looks like this book has some beautiful illustrations. This would make a wonderful gift!! I love Deb Gliori's picture books but didn't know about this one. It would probably be a great book to share with slightly older children than I usually read to (usually 3&4 yr olds) but could see myself using it in a program nonetheless. Great theme and I always enjoy her illustrations.